The coaching staffs for the IndyStar.com Indiana Girls’ All-Stars and the IndyStar.com Indiana girls Junior All-Stars have been set. 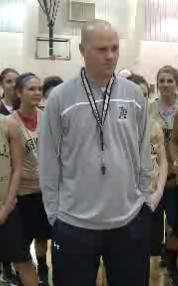 Eric Thornton, coach at Norwell, will lead the 2014 Indiana girls All-Stars as the seniors face Kentucky in the annual series that dates to 1940 for boys and 1976 for girls. He will be assisted by Amy Brauman of Brownsburg and Gretchen Miles of Washington. Kristi Kaniewski Ulrich of Penn is the head coach for the 2014 girls Junior All-Stars. She will be assisted by Donna Keck of Noblesville and Terry Rademacher of Borden. The Indiana All-Star juniors and seniors each will play four games over six dates June. The All-Star Juniors will face the Kentucky Junior All-Stars on June 6 at Scecina High School in Indianapolis and on June 7 at a site in Lexington, Kentucky. The Indiana All-Star seniors will face the Kentucky Senior All-Stars on June 13 at Transylvania University in Lexington and on June 14 at Bankers Life Fieldhouse in Indianapolis. The Indiana juniors and seniors will play exhibitions against each other on June 9 and June 11 at sites to be announced later. Thornton is a 1987 graduate of Churubusco High School and a 1992 graduate of Ball State. He began his coaching career as a boys assistant at Warsaw in 1991-92, then was a girls’ basketball assistant at Plymouth from 1992-97. He landed the Norwell job in 1997 and has compiled a 250-136 record in 17 seasons, including a Class 3A semistate appearance this season. Thornton was the Junior All-Star coach in 2012. Brauman is a Brownsburg graduate who was an Indiana All-Star herself in 1991. She played basketball in college at Illinois State and Marian University, then took over as head coach at her alma mater in 2007. She has amassed a 105-55 record in seven seasons with the Bulldogs. Miles has compiled a 76-49 record in six seasons at Washington, her alma mater. Miles was a standout player for the Hatchets, graduating in 1997 with 1,588 career points. She later played two seasons at the University of Southern Indiana and graduated from USI with a degree in elementary education. Miles was a junior high school in Washington for two years and a high school assistant coach for four years before becoming the Hatchets’ head coach. Ulrich will direct the 2014 Junior All-Star girls after guiding Penn to a 25-2 record this season, including a Class 4A state runner-up finish. A 1999 graduate of Mishawaka, Ulrich played at Bethel College in Mishawaka and helped the Pilots to Christian College national championships in 2000 and 2003. Ulrich has compiled a 108-14 record in five seasons as coach with the Kingsmen with state runner-up finishes in 2011 and 2014. Ulrich served as an assistant coach for four seasons at Mishawaka and two years at Penn before being named the Penn head coach in the spring of 2009. Keck recently completed her sixth season at Noblesville and is 70-55 with the Lady Millers. In 14 seasons as a head coach, including stops at Fort Wayne South and Greenfield-Central, she has a 166-129 record. The former Donna McCarty is a 1993 graduate of Clinton Central, where she played for Hall of Fame coach Linda Barnett and helped the Bulldogs to a sectional crown as a senior. She attended Taylor University, where she played basketball for two seasons. Keck started her coaching career at South Adams as an assistant coach for three seasons before becoming the head coach at Fort Wayne South for one season and Greenfield-Central for seven. She directed the Cougars to a sectional crown in 2004. Rademacher has compiled a 219-136 record in 17 seasons as a girls basketball coach, including a 17-3 record and sectional title this season. His teams have gone 206-128 in 16 seasons over two stints at Borden with sectional titles in 2002, 2003, 2011, 2012 and 2014. He just completed his fourth season of his second time as coach at Borden. Rademacher, was raised in Holland, Ind. He is a University of Evansville graduate, where he played baseball.